This, Part III, describes one Orthopedic Medical Clinic’s application of logical reasoning (IDEA) and the Scientific Method to the daily diagnosis and treatment of chronic back pain associated with sacroiliac joint sprain injury. The five phases of the Scientific Method (i.e., Question, Hypothesis, Testing, Conclusion, and Reappraisal) easily meld with the five headings of a traditional scientific case study report (i.e., Introduction, Materials and Methods, Results, Discussion, and Conclusion). Step 1.1. Describe an observation regarding a specific subject of interest. Seven years ago, the author empirically-abductively noted a seemingly distinct cohort of chronic back pain patients. These individuals predominantly presented with symptoms and signs diagnostic of sacroiliac joint dysfunction (SIJD) secondary to sacroiliac ligament sprain injury. Over that initial year, the author empirically-deductively-abductively treated the aforementioned chronic back pain patients with Prolotherapy of the sacroiliac and iliolumbar ligaments when diagnostically appropriate—based on those largely anecdotal teachings and compelling case study and trial reports. A large share of those patients seemed to respond favorably to Prolotherapy of the sacroiliac joint ligaments with resolution of their back pain symptoms. However, that positive observation was largely experiential and potentially very biased. There was need for more substantial evidence of patient safety, therapeutic effectiveness, and cost-savings in this clinic. If chronic back pain appears to be commonly associated with sacroiliac joint ligament sprain injury, could Prolotherapy of those joint ligament sprains be significantly procedurally safe, therapeutically effective, and managerially efficient in correcting such sprain injury and resolving patient pain and dysfunction in this clinic? Step 2.1. Gather all existing information relevant to the subject issue of inquiry. He prospectively designed standardized initial intake and ongoing visit recording forms to be used in the following six years. To formulate an empirical-deductive-abductive hypothesis, the author reviewed the current literature. He reviewed all relevant patient records at hand, looking for general patterns and trends. He prospectively designed standardized intake and ongoing visit recording forms to be used in the following six years. Also, he designed a computerized database to facilitate a quickly accessible, chronological, snapshot follow-up of major independent, dependent, and extraneous variable parameters. All record keeping followed HIPPA rules, maintaining patient anonymity and obtaining patient data use consent. Step 2.2. Identify all basic assumptions. Important to this initial, largely deductive reasoning process, one needs to single out certain basic, important assumptions and preconditions that are premised on already proven truths and established principles as previously outlined in Part II of this series.2Generally, these assumptions included managerial and fiscal preconditions, clinical preconditions, and experimental or procedural preconditions. One of the most important preconditions was that one must gather enough relevant information from a statistically large enough number of individual patient cases on which to deduce, at the most basic level of scientific reasoning, a proper substantiation (or non-substantiation) of the hypothesis. Inductive inferential interpretation through quasi-experimental data analysis might, also, be possible—again, if given enough patient numbers and dependent variables to measure therapeutic effect. Prolotherapy is a procedurally safe, therapeutically effective, and managerially efficient therapy for the treatment of sacroiliac joint sprain injury as a healing intervention for the associated chronic back pain in this clinic. This hypothesis was to be tested prospectively through the course of the next six years of Prolotherapy practice in an Orthopedic Medical clinic setting. Step 3.1. Identify all of the variables impacting on the testing process—largely a deductive process. Independent variables (i.e., what we change therapeutically in order to attempt to create a curative effect) consisted of whatever procedures that would be used for treatment. The treatments under scrutiny included Osteopathic Manual Therapy (OMT), local anesthesia, and Prolotherapy. OMT: Examining for sacral, pelvic, and lumbar-thoracic alignment and applying appropriate OMT musculoskeletal manipulation were essential for managing all patients through their course of Prolotherapy to minimize their back pain and, also, monitor their reaching the therapeutic endpoint. Examination and manipulation were performed according to a standardized protocol. Local Anesthesia: Injection of 0.5% procaine, a local anesthetic, was indispensable for its local anesthetic effect to minimize Prolotherapy injection discomfort, as well as being the diluent for the active proliferant substance. Prolotherapy Anatomic Targets: The specific anatomical target sites that were injected varied. Some patients were treated at just the distal iliolumbar and SIJ ligament attachments, bilaterally, (i.e., omitting injection of the proximal iliolumbar ligaments). Other patients were treated at both the proximal and distal iliolumbar and sacroiliac ligament attachments, bilaterally. Prolotherapy Proliferants: The various proliferant agents used included 12% Glucose, 1.25% Phenol/12% Glucose/12% Glycerin (P2G), as well as 12% Glucose/12% Glycerin, 0.1% Sodium Morrhuate, 2% Testosterone, and 2% Pumice—these being the concentrations after dilution. All constituents were diluted with 1.0% Procaine resulting in a 0.5% Procaine concentration. 12% Glucose and P2G were utilized as the two basic proliferants. The two terms, 12% Glucose “Plus” and P2G “Plus,” used in this report, refer to various modifications of the two basic proliferants made by adding various combinations of Glucose/Glycerin, Morrhuate, Testosterone, and/or Pumice. Dependent variables (i.e., what we observe as possibly being affected curatively by the therapeutic change) included measurable subjective and objective clinical and managerial parameters that reflected safety, effectiveness, and cost of the treatments employed. The patients assessed, diagrammed, and gauged their subjective levels of pain—and reported any adverse events. The physician assessed and documented objective, measurable physical examination findings—and documented and followed all adverse events. Patient costs were documented in QuickBooks®. Controlled variables (i.e., what we maintain as constant or unchanged so as to negate influencing the effect of an independent variable on a dependent variable) included a standardized physical examination and its recording by the physician. Likewise, all treatments were standardized—yet, had to meet the patients’ individual complaints and physical findings. Patient precautions were carefully taught (e.g., to avoid the use of anti-inflammatory medications). These instructions were provided to the patient through a very complete, standardized informed consent form—a copy of which was given to each patient. Extraneous variables (i.e., an inherent characteristic of the population being studied that might further clarify the independent-dependent variable relationship) included patient gender, age, and right-left hand preference. Also, monitored were assessments of static posture (e.g., shoulder dropping or unleveling, foot arch flattening, and foot-ankle pronation or supination); dynamic posture during gait (e.g., short-leg quick-step and foot-ankle internal rotation-supination); foot-ankle and first toe dorsiflexion strength; Gluteus medius leg abduction strength; leg length comparison; sacroiliac joint mobility; ileal alignment; lumbar, thoracic, and cervical vertebral alignment; and thoraco-costovertebral alignment. Measurements of these ancillary parameters were the product of every musculoskeletal examination and they reflected various forms of associated physical injury and dysfunction. Step 3.2. Design an experimental test or clinical protocol that will prove—or disprove—the hypothesis—largely an empirical-deductive-abductive process. Physician assessment of sacral alignment at the sacral inferior angles. SIJD Diagnostic Criteria for Prolotherapy Candidacy: The physical criteria for the diagnosis of sacroiliac joint sprain injury and unstable sacral dysfunction were assessed with the patient lying on the examination table. Assessment was made of sacral alignment in concert with a complete musculoskeletal examination from plantar arch to nuchal line. 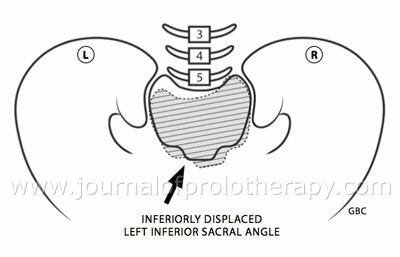 If either left or right sacral inferior angle was displaced inferiorly, the criterion for SJID was met.5, 6 Assessment of several ancillary parameters served to clarify the diagnosis of SIJD and sacroiliac joint stability, including testing Gluteus medius abduction strength and assessing lumbar vertebral alignment. The diagnosis was tested by performing OMT to the sacrum, pelvis, and lumbar spine, as appropriate, until the sacrum was normally aligned. Then, the patient came off the examination table and walked 60 feet to test the patient’s sacroiliac joint stability while weight bearing. Upon reassessment on the table, if the sacral inferior angle had returned to its earlier observed inferior displacement, the sacroiliac joint was deemed unstable upon weight bearing and the patient was confirmed a candidate for Prolotherapy. Figure 1. Sacral Misalignment. The left sacral inferior angle is displaced inferiorly as palpated with examiner’s two thumbs. Treatment Criteria: Prolotherapy treatment consisted of a standardized routine of anatomical landmark palpation, identification, and marking; swabbing the injection sites with alcohol and 1% iodine for antisepsis; skin anesthetization with 1% procaine; and performing the Prolotherapy injections. Over the subject six years, Prolotherapy involved a varied selection of anatomical targets and proliferant solutions, depending on the assessed degree of iliolumbar and sacroiliac ligament sprain injury, as described under independent variables. Figure 2. Treatment Injection Sites. 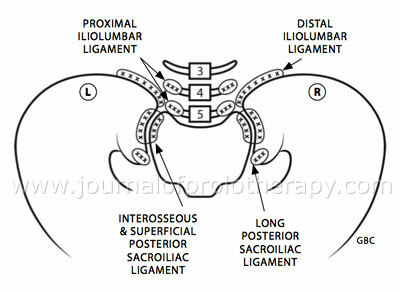 Injection sites included the tips of the transverse processes of L4 and L5 (proximal iliolumbar ligament), the superior-anterior surface of the medial iliac crest (distal iliolumbar ligament), the deep interosseous and superficial components of the superior posterior sacroiliac ligament, and the long posterior sacroiliac ligament at the inferior aspect of the PSIS, all bilaterally. Treatment was considered at an endpoint when the patient returned to demonstrate a normally aligned sacrum on the examination table after the usual 3-4 week post-therapeutic healing period. The patient contributed an endpoint subjective pain assessment report at that time. Institutionalizing the Protocol: The uncontrolled, non-randomized clinical trial design was incorporated into all of the formal clinical paperwork and procedures. All procedural and clinical result descriptions were documented in all appropriate patient chart records. Importantly, all parameters were, likewise, documented and tracked using a computer-driven database, as previously described.2 Each patient received a thorough explanation, aided by skeleton demonstration and hand drawn illustrations of the problem at hand. Step 3.3. Perform clinical treatment appropriate to each patient’s case to prove or disprove the hypothesis. This is, perhaps, the hardest step of all the Scientific Method phases. It requires assiduous concentration on completeness of all the standard diagnostic and therapeutic procedures, maintaining consistent detail in all documentation, and pursuing thoughtful follow-up. Step 4.1. Collect, collate, and analyze the resultant data. General Demographics: Over the course of six years, 77 patients with chronic back pain tested positively for SIJD. Of those, 54 (70%) tested positively for SIJD with sacroiliac instability, meeting the criteria for Prolotherapy candidacy. The other 23 (30%) remained stable after walking 60 feet. Not requiring immediate Prolotherapy, the latter group received musculoskeletal follow-up—there were no known recurrences amongst the stable group. Of the 54 chronic back pain patients with unstable SIJD, 34 were female (63%) and 20 were male (37%). The female age range was 14 to 68 with an average age of 42.9 years and median age of 44.5. The male age range was 26 to 64 with an average age of 48.2 years. All 54 patients were right-handed. Fifty-two were Caucasian, 1 was African American, and 1 was American Indian. SIJD Diagnoses: Of the 54 unstable SIJD patients of both genders, 44 (81%) demonstrated a left sacral inferior angle displaced inferiorly, which was diagnostic for a left sacroiliac joint dysfunction. 10 (19%) demonstrated a right sacral inferior angle displaced inferiorly, which was diagnostic for a right sacroiliac joint dysfunction. Of the 34 female unstable SIJD patients, 28 (82%) demonstrated a left sacroiliac joint dysfunction. 6 (18%) demonstrated a right sacroiliac joint dysfunction. Of the 20 male unstable SIJD patients, 16 (80%) demonstrated a left sacroiliac joint dysfunction, while four (20%) demonstrated a right sacroiliac joint dysfunction. Patients with Left SIJD (LSIJD) and Right SIJD (RSIJD) seemed to present repeated physical patterns. For example, a common pattern of dependent and extraneous variable parameters for a Left SIJD was an inferiorly displaced left sacral inferior angle rotated anteriorly—accompanied by a left-sided quick-step gait; dropped right shoulder; left ileal flexion; restricted left sacroiliac joint mobility; lumbo-vertebral right rotation and left side-bending; thoraco-vertebral right rotation at T12; thoraco-costovertebral left rotation at T6; functionally short left leg; inhibited left leg abduction; supinated left foot; and pronated right foot. Presenting Pain Patterns and Severity Levels: For the 54 patients, overall, the general pain pattern mirrored that of the two subgroups, 35% complaining of central low back pain and 24% complaining of left low back pain. The combined range of pain was 3 to 9 (out of 10) and the average presenting pain level was 6.1. For the 34 female patients, overall, the general pain pattern was central (32%) and to the left of center (26%). Their initial presenting pain range was 3 to 9 and the average pain level was 6.8. Among the 28 females diagnostic of LSIJD, there was, also, an overall concentration of pain to the left of center (32%) and central (39%). Their presenting pain range was 3 to 9 and average pain level was 5.6. The 6 females with RSIJD reported a general concentration of pain central (83%). Their presenting pain range was 5 to 9 and average pain level was 8.2. For the 20 male patients, overall, the general pain pattern was central (50%) and to the left of center (25%). Their presenting pain range was 2 to 9 and the average pain level was 4.8. Of the 16 males with LSIJD, there was, also, a general concentration of pain (50%) central and to left of center (25%). Their presenting pain range was 2 to 9 with an average pain level of 6.8. The 4 males with RSIJD reported a predominance of pain central (50%). Their presenting pain range was 3 to 8 with an average pain level of 5.5. Prolotherapy Effectiveness: For the 54 patients, overall, the combined average Prolotherapy requirement was 2.9 treatment sessions. The 44 with LSIJD required 3.1 sessions and the 10 with RSIJD required 2.0 sessions. For the 34 females, the combined average Prolotherapy requirement was 3.9 sessions. The 28 with LSIJD required 3.3 sessions and the 6 with RSIJD required 1.8 sessions. For the 20 males, the combined average requirement was 2.8 sessions. The 16 with LSIJD required 2.9 sessions and the 4 with RSIJD required 2.3 sessions. Pre- to Post-therapeutic Severity Levels: For the 54 patients, overall, the average change of reported pain, pre- to post-treatment, was a decrease from 6.2 to 1.9 with a percentage decrease of 69%. The total group of 34 female patients reported an average decrease of pain from 6.1 to 2.0 with a percentage decrease of 67%. The LSIJD group of 28 patients reported a pain decrease by 62%. The 6 females in the RSIJD group reported an 82% decrease. 14 (41%) female patients reported complete pain relief (i.e., zero residual pain). The total group of 20 male patients reported an average decrease of pain from 6.5 to 1.6 with a percentage decrease of 75%. The LSIJD group of 16 patients reported a pain decrease by 76%. The 4 males in the RSIJD group reported a 67% decrease. Eleven (55%) male patients reported complete pain relief (i.e., zero residual pain). Anatomical Target Effectiveness: The “Distal Group” represented the Distal Iliolumbar Ligament and Sacroiliac Ligament, bilaterally. The female and male Distal Group patients required an average of 3.8 and 2.2 sessions, respectively, to reach the anatomical endpoint. Their combined average treatment requirement was 3.3 sessions. The “Full Group” represented the Proximal and Distal Iliolumbar Ligament and Sacroiliac Ligament, bilaterally. The female and male Full Group patients required an average of 1.9 and 2.6 sessions, respectively. Their combined average requirement was 2.2 sessions. The difference between the Distal Group and Full Group represented a 33% reduction of required treatment sessions for the Full Group. Proliferant Effectiveness: 12% Glucose, 12% Glucose “Plus”, and P2G resulted in reaching the physical endpoint for 20 patients requiring an average of 1.9, 1.5, and 1.7 treatment sessions, respectively—the overall average for all three options was 1.8 sessions. P2G “Plus” combinations required an overall average of 4.0 sessions. Any of the additive combinations to P2G (i.e., any P2G “Plus” combination) caused treatment requirements of an average of 3 or more sessions. That represented an overall 222% additional treatment requirement for the P2G “Plus+” group. Adverse Events: Review of the 54 records revealed that 2 patients experienced transient numbness, each involving small areas (4 to 9 cm in greatest dimension) over one or the other buttock lateral to a posterior superior iliac spine (PSIS). Both events occurred subsequent to Prolotherapy being injected at the inferior-most PSIS, “Hackett’s Point D” landmark. Both patients experienced full recovery without any residual numbness after 2 to 3 months. There were no infections. There were no permanent adverse neurological or vascular events. Therapy Cost: For 54 patients, the accumulative patient cost for each series of Prolotherapy included $250 for the introductory diagnostic visit (which included diagnostic and therapeutic OMT) and $450 for each Prolotherapy session, which also included OMT assessment and realignment. For the average patient, overall, that amounted to $250 + $1305, totaling $1555, for the resolution of a chronically painful, therapeutically recalcitrant major musculoskeletal misalignment. Step 4.2. Interpret the resultant data—largely a deductive-inductive-abductive process. This prospective, unrandomized, uncontrolled case series study report of 54 chronic back pain patients reveals some evidence that helps to characterize Prolotherapy as a safe, effective, and efficient approach for treating chronic back pain secondary to sacroiliac joint (SIJ) ligament sprain injury with SIJ dysfunction. It also raises some questions. Demographically: The overall numbers were statistically relevantly small. Also, the percentages reflected a self selected statistical “universe”—not a randomized sampling. Accepting that, amongst the 54 total patients, there was a preponderance of female patients; the overall rate for all females (63%) was nearly double that for all males (37%). Additionally, females presented at a younger age. Why? Is this a genomic effect (e.g., general ligament laxity) or a hormonal effect (e.g., relaxin)? Also, there were no left-handed patients.Why? Is SIJD a right-handed disease in a right-handed world? Are left-handed individuals spared the kinetic strain and sprain at their SIJ in a right-handed world? Also, there were no Hispanic patients and only 1 African American and 1 American Indian. Why? Is there a socio-economic or a biomechanical reason? Diagnostically: The prevalence rates for unstable Left SIJD (an average of 81%) compared to Right SIJD (an average of 19%) suggested a statistical homogeneity between the genders in spite of hormonal differences. However, these figures also suggested that there was a preponderance of Left SIJD in the population studied compared to Right SIJD at about a 4 to 1 ratio. Why? Is this a reflection of SIJD patients being predominantly right-handed and that the left SIJ and its ligaments are continuously at the terminus of the musculoskeletal kinetic chain.7 As these individuals constantly torque from the left low back into a right-handed world, do they preferentially stress, strain, and sprain the left SIJ ligaments—sparing the right SIJ, which are in the middle of the kinetic chain and protected to some extent? This report suggests that SIJD is, at least, one significant cause of chronic back pain. It suggests that the physical diagnosis for SIJD can be used for determining therapeutic endpoint. It suggests that a reliable diagnosis of SIJD can be simplified by measuring only one parameter, i.e., sacral inferior angle orientation. Therapeutically: This report suggests that OMT by itself—without Prolotherapy—may resolve SIJD and its symptoms in, at least, some patients. The computer database created for these patients and chart review showed that OMT resolved the problem in 30% of the patients assessed for Prolotherapy candidacy. The OMT resulted in those patients having a stable SIJ and mitigating their back pain and other secondary compensatory physical dysfunctions. This report does not address how many of those patients may have gone on to have a SIJD recurrence seen by another practitioner—however none returned to this clinic with a recurring complaint although some returned for treatment of other joint injuries. This report data suggests a therapeutic effectiveness of Prolotherapy for treating SIJD with chronic back pain. It was 100% effective for the 54 patients reviewed—OMT, alone, did not suffice for these patients. The overall number of treatments required was 2.9 sessions. There was a trend that suggested that Right SIJD consistently required fewer treatment sessions (an average of 2.0 sessions for RSIJD versus 3.3 for LSIJD), perhaps reflecting a less severe sprain injury of the Right SIJ ligaments compared to the Left SIJ ligaments in these right-handed patients living in a right-handed world. Prolotherapy resulted in pain reduction among females, overall, from an average of 8.2 to 1.5 (82%). Males showed an average pain reduction from 5.5 to 1.8 (67%). 41% females and 55% males reported complete pain relief (i.e., zero residual pain), respectively. Sacral, pelvic, and lumbar misalignment is a complex set of interrelated anatomic and physiological relationships. Resolving just one pain-generating sprain injury and misalignment of the SIJ does not necessarily resolve all the other residual misalignments, skeletal molding, and postural habits that still require further therapy to totally resolve the patient’s presenting back pain. There might even be some degenerative disc disease (DDD) and related neurogenic component. However, it is suggested that DDD is much less prevalent a cause of back pain than is conventionally touted compared to sacral, pelvic, and lumbar ligament sprain injury—not one of the 54 subject patients presented with neurological signs. It might be said that a major weakness of this report is that the treatments varied in terms of the anatomic targets and proliferants used. On the other hand, as a pilot report, these variations provide some internal gauges against which the end results can be measured in a quasi-experimental fashion and generate various suggestions for more specific scientific study. Regarding anatomic target effectiveness, injecting both proximal and distal iliolumbar ligament SIJ ligament attachments, bilaterally in both genders, resulted in an average requirement of 2.2 sessions—as compared to an average requirement of 3.3 sessions when the proximal iliolumbar ligament was omitted. This report suggests that treating the proximal iliolumbar ligament is important in maximizing the effect of this bilateral treatment. Regarding proliferant effectiveness, this report suggests that 12% Glucose, 12% Glucose “Plus”, and P2G proliferants resulted in requiring substantially less treatment sessions than any combination of P2G “Plus.” An overall average of 1.8 sessions was required for the first three proliferants, combined, compared to the overall average of 4.0 sessions required for all P2G “Plus” combinations. This report suggests a 222% decrease in effectiveness for P2G “Plus.” Why? What is there in P2G “Plus” that may possibly delay healing? Also, the study suggests that Glucose, alone, is as effective a proliferant as any of the other choices. Why? Is there a reason for searching for any more effective a proliferant? Regarding Procaine effect, injection of a local anesthetic might produce some additional Neural Therapy effect, especially in reducing accompanying lymphedema. This may effect the Prolotherapy effect, one way or the other. Adverse Events: Two (2) occurrences of transient numbness were the only adverse events. These presumably occurred after needle injury of a cluneal sensory nerve. With 54 patients receiving a minimum of 8 injections requiring an average of 2.9 sessions, the number of total injections amounted to over 1000 Prolotherapy needle wounds. That amounts to an averaged incidence rate of 0.002% per injection. There was no permanent adverse neurological or vascular event. This all occurred in a solo musculoskeletal clinic unassociated with any hospital or organized peer safety committee. Cost: The average cost of SIJD Prolotherapy in this clinic is $1555. The comparative cost for L5-S1 surgical fusion is $30,000 to $40,000, which often does not resolve pain and dysfunction since the diagnosis of SIJD has been missed. Prolotherapy of SIJD treats the main cause of a many chronic low back pain complaints, some of which are mistaken for L5-S1 degenerative disc disease. Prolotherapy of chronic back pain associated with SIJD is comparatively very cost-effective. Can back surgery boast of such a high cure rate and such minuscule adverse events? Step 4.3. Draw a conclusion. Conclusion: Prolotherapy is an extremely safe and very efficacious (both therapeutically effective and cost-effective) treatment for sacroiliac joint ligament sprain injury causing chronic back pain in this clinic. Furthermore, it raises questions that might be directed to the practice of Prolotherapy in an Orthopedic clinical setting, in general. Step 5.1. Distribute the results to other clinicians and researchers. This published case report is an example. Step 5.2. Reobserve, replicate, retest and form a new, refined hypothesis. I invite all readers of this study to scrutinize this report carefully and critically. I invite all researchers in the field to consider the questions that this report presents. This encouragement is especially aimed at the pursuit of randomized, controlled studies of the overall effectiveness of Prolotherapy for SIJD-associated chronic back pain, as well as more vigorously studying the comparative effectiveness of various anatomic injection targets and proliferant constituents. 1 Clark GB. Building a rationale for evidence-based prolotherapy in an orthopedic medicine practice. part I. A short history of logical medical decision making. Journal of Prolotherapy. 2(Nov):512-519;2010. 2 Clark GB. Building a rationale for evidence-based prolotherapy in an orthopedic medicine practice. part II. How to meld scientific methodology into the daily practice of prolotherapy. Journal of Prolotherapy. 3(Feb):582-587;2011. 3 Hackett GS, et al. Ligament and Tendon Relaxation Treated by Prolotherapy. 5th ed. Oak Park, IL: Gustaf A. Hemwall, MD;1993. 4 Dagenais S, et al. Prolotherapy injections for chronic low back pain. Cochrane Database of Systemic Reviews, 2007, Issue 2. 5 Greenman PE. Principles of Manual Medicine, third edition. Baltimore: Lippincott Williams and Wilkins; 2003. 6 Maitland J. Spinal Manipulation Made Simple. Berkley, CA: North Atlantic Books; 2001. 7 Ravin T, et al. Principles of Prolotherapy. Denver, CO: American Academy of Musculoskeletal Medicine; 2008. The author is grateful to Allen Parker, EdD; Thomas Ravin, MD; and Carol Schneider, PhD, for their expert and wise shepherding of this publication.